What a blogger learned from a year of traveling to restaurants that used to be part of much larger chains before being forced to fend for themselves. Hey all, Ernie here with a special treat for today’s Tedium. Recently, I was informed that someone had seen a piece I had written a while ago about fast food failures—and was inspired by it to take some adventures of his own. 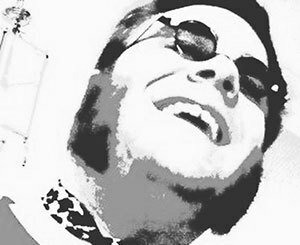 I asked the blogger, who goes under the pen name Zap Actonsdower, to write about his adventures. Here’s what he sent along. Today’s GIF comes from a clip of chains breaking in slow motion, because what else could we have chosen for this? Something fast-food related? Oh, that would have been too easy. Still going on: The Tedium Presidential Giveaway! A significant lack of canned peaches in your life bringing you down? We know just the album to help with that. 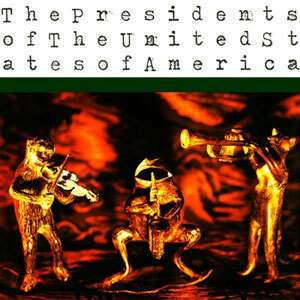 Fill out this form to win a gently used copy of PUSA’s fantastic debut album, which we highlighted last week. Let us know your favorite Tedium piece from 2018 and you’ll be entered to win one of TWO CD copies of the album! Please take only as directed. No purchase necessary to win. Offer not valid in Middle Earth, Asgard or any of the nine realms. If you can read this, you don’t need glasses. How does one get into this kind of research, anyway? Seeking out the rare examples of endangered restaurant brands has been an interest of mine since my childhood in early ’90s in Central Kentucky. It was there that I noticed that all the locations of my favorite fast food places were suddenly disappearing. It was during my early elementary school years that Lexington, Kentucky lost its locations of G.D. Ritzy’s, an art-deco-themed hamburger and ice cream chain founded by a former Wendy’s executive, and Taco Tico, a Kansas-based chain that sold a middle-American interpretation of Mexican food. 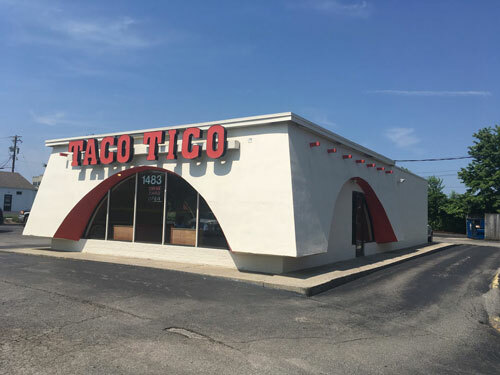 As soon as I was able to drive, I was tracking down still-operating Taco Tico and G.D. Ritzy’s locations using AskJeeves and Mapquest, and saving my pocket change for gas to drive multiple hours just to experience a nostalgic meal. It was an odd hobby that gave me immense enjoyment. For the next 15 years, I’d take little trips to forgotten chains off and on, maybe once or twice a year. Last year, my search got more serious—I found myself with excess free time and creative energy. For reasons not notable enough to discuss here, the metaphorical chains that had shackled me to a conventional suburban life had been severed, and I was in need of a diversion from my routine. I had recently stumbled on the Tedium article, “Fast Food Failures: Kenny Rogers Roasters and More,” and wished I could find more content related to the remnants of near-defunct restaurant chains. Partly inspired by that article, and by a guy known as The Evil Sam Graham, who ran a (now long-gone) website with reviews of national and regional fast food chains, I started spending my weekends on the road seeking out the last functioning examples of restaurant empires that had otherwise crumbled. My goal was to experience the little bits of living history these anachronistic businesses offered and share my experience from as many angles as possible with anyone who happened to share my esoteric interest and find their way to my blog. In my year of travel, I’ve learned quite a bit about the nature of failed chain restaurants. Here’s what I’ve learned. Typically they’re stuck in the era just before the chain’s parent company stopped actively marketing the brand. 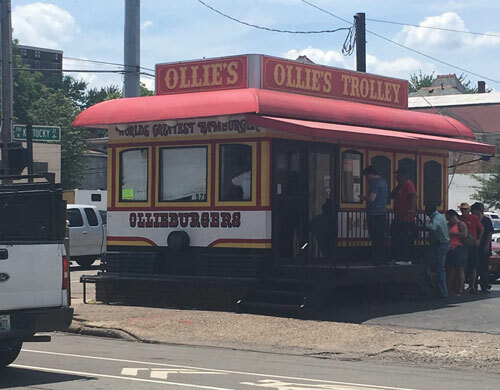 Buildings like the tiny faux trolley car that houses Ollie’s Trolley in downtown Louisville, Kentucky, or the tall, bright red, angular roof above the last operating Hot ’n Now in Sturgis, Michigan, tend to stand out amid the nondescript rectangular buildings that modern fast food establishments have been renovated into. They date from a time when zoning restrictions were minimal, and businesses sought to attract customers with outlandish architecture and brightly colored roofs. If you’re lucky, the interiors of these places will be just as anachronistic as the exteriors. For instance, the G.D. Ritzy’s locations in Evansville, Indiana are exactly as I remember the G.D. Ritzy’s dining rooms of my childhood to be, with stainless railings, etched glass, hexagonal tile, and marble tabletops all meant to evoke a 1940s aesthetic. Even the cups and food wrappers sport the same logos and ad copy that they did more than a quarter century ago. A momento tray liner I swiped from an Evansville G.D. Ritzy’s this spring has a 1990 copyright date printed on it. 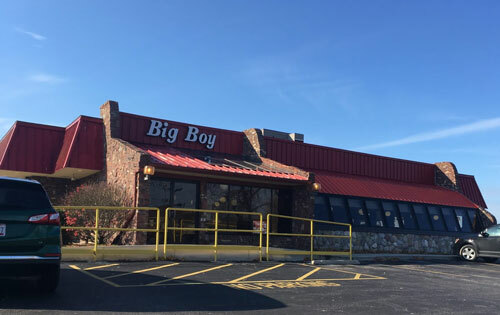 Big Boy, a constant target of rip-offs by other chains, despite its much-smaller profile these days. I mention Kewpee specifically because it was the favorite restaurant of a young Dave Thomas the founder of Wendy’s, which opened for business just as the Kewpee chain was in sharp decline. In an interview shortly before his death, Thomas implied that the food at Kewpee was his inspiration for the menu at Wendy’s. I can tell you firsthand that a burger, fries, chili, and “Frosted Malt” from one of the three Lima, Ohio Kewpee locations all remind me of slightly better versions of their analogs from a modern Wendy’s, with the Frosted Malt being a real standout, like a thicker, creamier, objectively better Wendy’s Frosty. Not all the knockoff chains were as successful as Wendy’s. I probably don’t have to tell you what fast food chain inspired Maryland Fried Chicken, but unless you live in Florida, where the chain originated, despite their name suggesting otherwise, you probably haven’t heard of them. In other instances, imitation acts as a springboard to bigger and better things. Lexington, Kentucky-based Jerrico conceived the relatively original Long John Silver’s and Fazoli’s chains, but launched both with profits from their first chain, Jerry’s, which closely copied the playbook of local Big Boy franchisee, Frisch’s. Big Boy’s eponymous signature double deck hamburger is perhaps the most-copied menu item in fast food history. Seemingly every burger chain at some point has had their own three-piece bun, two-patty, special sauce-drenched burger—the best-known of which is the McDonald’s Big Mac, which has long ago surpassed the success of the Big Boy. Big Boy is a literal broken chain, as it has fractured into several smaller chains, some more successful than others. There’s more to eating at broken chains than spotting knockoffs, though. The famous Dutch Pantry apple fritters. 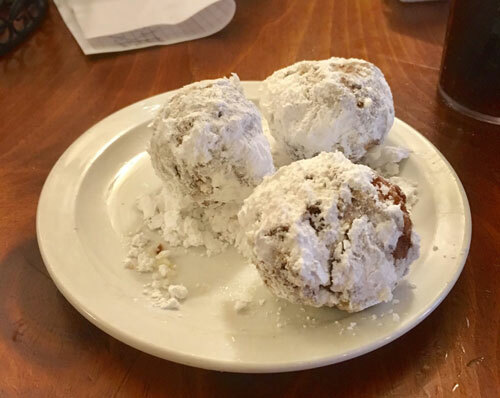 Items like the piping hot, powdered sugar-covered apple fritters served at the three surviving Dutch Pantry restaurants in West Virginia and Pennsylvania are unlike anything dessert I’ve ordered anywhere else. Doughnut hole-sized and fried to order, they’re brought directly from the fryer to your table. The Ollieburger from Ollie’s Trolley, (and it’s completely extinct sister chain, Lum’s) is a symphony of flavors that transcends the concept of the hamburger itself, thanks to the hamburger patties being marinated in a blend of 23 secret herbs and spices by devised by its inventor, Ollie Gleichenhaus, a man once heralded as the Colonel Sanders of hamburgers. Likewise, I’m not exaggerating in the slightest when I say that the ice cream at G.D. Ritzy’s is the best I’ve ever had. Sixteen flavors are made from scratch in-house using award-winning proprietary recipes at all but one of the seven surviving locations of the chain that once had around 100 locations in Ohio and surrounding states. Unfortunately, not all broken chain experiences are so positive. The menu board at a Ponderosa location really makes you excited about the food. The quality of the overall experience at a broken chain is inversely proportional to the number of its surviving locations. Chains like York Steak House, Druther’s, Clancy’s, and Hot ’n Now are all down to one location each, and the meals I’ve enjoyed there have all been stellar, leaps and bounds superior to the average meal one might experience at a more modern chain restaurant. On the other hand, my experiences at diminished chains like Ponderosa, which is hanging on with around 60 U.S. locations open (down from 600), and Blimpie, which still boasts 250 operating locations, (down from a peak of over 2000), have ranged from mediocre to actually making me physically ill. I suspect the reason the sole surviving location of a defunct chain offers such great experiences is the result of a Darwinian culling of the less competent franchisees leaving only the best operations to survive, often outliving their corporate parent by decades. Conversely, the larger chains I consider to be broken often still have a corporate parent managing, mismanaging, or neglecting a brand, and allowing franchised and corporate-owned locations to decline. If they’re lucky, their best franchisees will carry on as the best examples of the brand long after the parent company dies. A broken chain is often born as the result of a company that once sold franchises ceasing operations leaving its franchisees to operate independently. Without a formal franchise agreement, owners of newly-independent businesses, linked to one another by little more than a shared name and history, may begin to vary operations gradually through the decades. For instance, a Frostop drive-in I visited in Indiana was still selling the chain’s signature made from scratch root beer while another unit in the Frostop chain in Illinois was selling what I’m 90 percent sure was Barq’s Root Beer. With no corporate support since the early 1980s, the various surviving Frostop operators diverged and slowly evolved in different directions. When I write about a chain that still has multiple operating locations, I try to visit more than one of those locations whenever possible, to get a good idea of the current state of the brand. I had real trouble writing about Rax Roast Beef, an Arby’s-like chain with six operating locations—down from over 500 in the 1980s. The first four locations I visited all had stripped-down menus with a few sandwiches, twisty fries, (similar to, but legally distinct from curly fries) and little else. The interior of a Rax location with a salad bar. 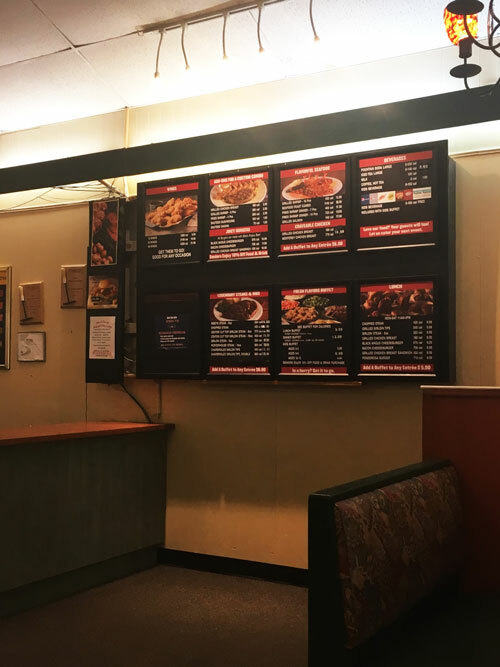 Even with a basic menu, the food I experienced at these locations was served to me lukewarm, and I could find little to say about an experience that reminded me of eating at a particularly terrible Arby’s. Hoping for the best, I put off uploading an Rax post until I could experience the Joliet, Illinois location, which I had heard still had an operating salad bar, unlike the Rax locations I had visited in Ohio. What awaited me in Joliet was a fully-stocked, impeccably clean Rax salad bar that included desserts and taco fixins, just as it did in the chain’s 1980s heyday. The roast beef sandwich I ordered was hot and fresh, as were the twisty fries. It was the Rax experience I hoped for, and I was overjoyed to find it still existed. All it took was driving a couple hundred miles to find a perfectly preserved Rax experience. In fact, I’m constantly astounded by the level of preservation I find in still operating chain restaurants. 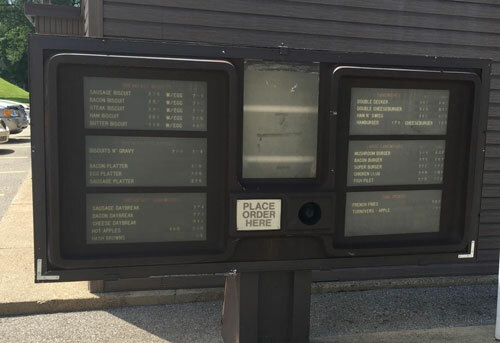 The drive-thru menu sign at Suzi’s, a restaurant that used to be a Burger Chef. That’s the title of my very first blog post, which included an early mission statement, and a picture I took of the last operating Sam Goody when I was in San Diego several years ago. When I wrote that post, I was planning a trip that included dinner at Fowlerville Farms in Fowlerville, Michigan, a former location of the long dead Nickerson Farms chain of highway-adjacent restaurant/gas station/souvenir shop businesses that were the predecessors of the modern travel centers. Fowlerville Farms still operates much as it did under the Nickerson name. When I set off on that trip, I had no idea that, through careful Googling and with some help from the readers of my blog, I’d find other near-forgotten fast food treasures operating under new names including The Farm in Racine, Wisconsin, essentially a Red Barn location operating under a different name, the last vestige of the long-defunct Red Barn chain. It was nice to experience a little bit of Red Barn magic in Wisconsin, but the most jaw-droppingly amazing experience was when I found my white whale. Burger Chef was a chain that started in Indiana in the early 1950s, and for a time, was McDonald’s largest competitor. Mismanagement forced them into obscurity in the 1980s, and the last Burger Chef location closed in 1996. A place called Schroeder’s in Danville, Illinois was essentially a Burger Chef franchise stripped of all of its branding and survived until its closure in 2015. 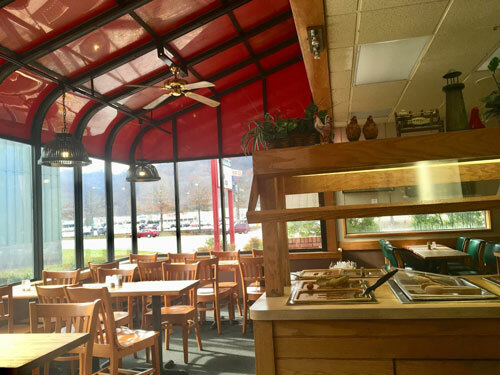 I never got to eat at Schroeder’s, and I thought I had missed my opportunity for a Burger Chef experience, until I found a second chance in West Virginia. Suzi’s in South Charleston is housed in a former Burger Chef building and is owned by a former Burger Chef regional manager. They use the original 1970s Burger Chef menu boards and serve food, that near as I can tell, is very close to Burger Chef food. Whenever I’m anywhere remotely close by, I have to stop in for a “Double Decker,” a renamed version of Burger Chef’s Big Boy-inspired Big Shef, and a Chicken Club, my favorite fast food chicken sandwich which also dates back to the Burger Chef days. Every time I visit, I stand in awe of how well preserved everything about the place is, despite it being a working restaurant. Like many of the places I visit, I think of Suzi’s less as a fast food joint, and more as a working museum exhibit, operating just as it did when Burger Chef was beginning its final decline, nearly forty years ago. My favorite places that I visit gathering blog fodder have that working museum vibe, providing a glimpse of what time travel must be like, but some broken chains feel decidedly modern. Roy Rogers, an improbable Broken Chains comeback story. Roy Rogers is a perfect example of this phenomenon. It’s a fast food concept that was largely developed by Marriott in the 1960s and grew to around 600 locations before Marriott decided they wanted out of the restaurant business, and in 1990, sold the Roy Rogers brand to Imasco, then parent company of Hardee’s, who converted most Roy Rogers locations to Hardee’s locations. That’s when Pete stepped in. Pete Plamondon Sr. was a former Marriott executive who had helped develop Roy Rogers in the 1960s, then left the company to run his very own Roy Rogers franchise. He would go on to purchase the Roy Rogers name from Imasco, and slowly begin opening new locations. 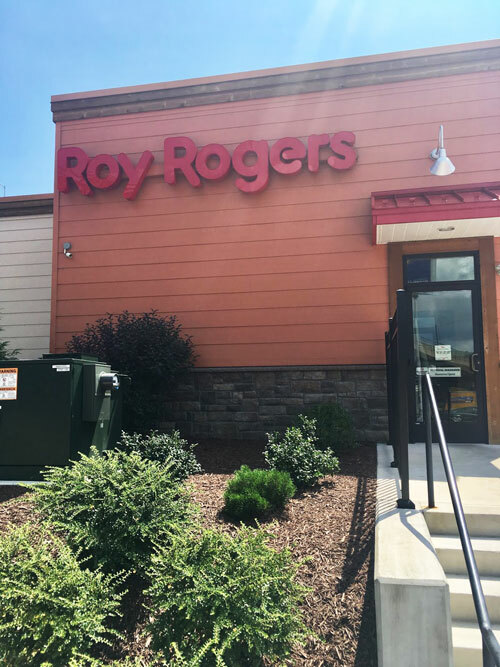 Today, there are around 25 Roy Rogers restaurants in operation in the Mid-Atlantic, and the company is still controlled by the Plamondon family. The Roy Rogers I visited in Maryland felt totally modern, yet unlike any other fast food place. I’m looking forward my next trip through their operating territory so I can go back to sample more of the menu. Other chains like Zantigo (the creators of the chili cheese burrito, of course), Naugle’s, and Gino’s have been resurrected as well, and I’m excited to visit all of them when I get the chance. The most notable (to me) chain resurrection came this year, though. My beloved G.D. Ritzy’s opened its first new location in over a decade in Columbus, Ohio, the city where they got their start. It’s owned and run by the chain’s founder, Graydon Webb, and his family. Not only did it cut my drive time to a G.D. Ritzy’s location nearly in half, it also represents what I hope is a bright future for my beloved childhood fast food chain. On my drives to experience broken chains, I often fantasize about a future where my hometown has a few G.D. Ritzy’s locations, and maybe, just maybe, I can afford to buy a G.D. Ritzy’s franchise of my own to run just like the ones I grew up with. Back in the present, G.D. Ritzy’s isn’t franchising yet, (I’ve asked!) and is still in the early stages of what I hope will be a widespread resurgence. Even without a full-blown comeback, the majority of the places I visit are survivors, formerly franchised locations that often have outlived their parent companies by decades. It’s this staying power that keeps the locations of broken chains open and interesting and keeps me on the road seeking them out. After a year and countless hours of driving, I haven’t lost interest in broken chains, or run out of new places to visit yet. I’m always planning, and looking forward to my next trip to be a customer at an obsolete business and to share the experience with the world. In some small way, I like to think that by experiencing and writing about broken chains, I’m both witnessing and preserving pieces of history that are thought, by most, to be extinct. My hobby as an amateur historian in the decidedly uncrowded field of chain restaurant history has been immensely rewarding. As long as there are locations of broken chains that are surviving and thriving, I’ll continue to seek them out to catch and share a unique glimpse of culture that’s often all too fleeting. Zap Actionsdower runs the blog Broken Chains and has been afflicted with a lifelong curiosity regarding the overlooked and under-appreciated. His interests are esoteric and intense.